The dispute is going into October. DUBLIN BUS DRIVERS are to strike for 13 additional days next month as the dispute with the company grows. The dates for the strike have now been confirmed after unions informed management at the bus company. A 24-hour stoppage on Saturday 29 October. The decision was taken by the five trade unions involved in the dispute. Commenting on the announcement of further action, National Bus and Rail Union general secretary Dermot O’Leary said it is “unfortunate that Dublin Bus and those responsible for providing a public transport service for citizens will not engage with bus workers”. O’Leary said it was a “sad indictment” on those appointed to provide this service that service disruptions were allowed to become “the de-facto norm”. He added that his union and the others involved in the dispute are prepared to immediately engage in intensive discussions to resolve this pay dispute. We cannot, however, resolve it on our own. One Siptu official earlier told TheJournal.ie that the decision to bring the strike into a second month was taken after it was felt that drivers’ claims are “not been taken seriously” by management or the government. In a statement announcing the strike action, the union’s division organiser Owen Reidy said it seems “management of Dublin Bus and the Department of Transport have little interest in resolving outstanding issues”. Our members are disappointed that the only response so far from the CEO of Dublin Bus to this dispute has been to call for talks at the Workplace Relations Commission to discuss a Labour Court recommendation that has already been rejected by over 90% of our members. It is not a genuine attempt to find an agreed resolution to this dispute. 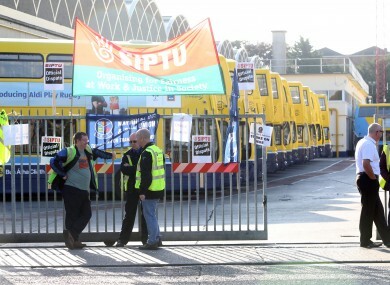 Workers at Dublin Bus remain on strike today, in the second of two 48-hour stoppages. Reacting to the news of an additional 13 days of action, Dublin Bus said it is “unnecessary and unjustified and will continue to cause significant disruption to our customers and trade in Dublin city”. To date, it said the industrial action has cost the company in excess of €4 million and “continues to impact on the financial stability of the company”. For his part, the Minister for Transport said he “regrets the grave invoncenience” but will not be involving himself in the dispute. Shane Ross said he is “acutely aware of calls for him to directly intervene, but must reiterate, that as any Ministerial intervention could be interpreted as a commitment to open the State chequebook”. He said it would be inappropriate for him to do so and again called on management and unions to engage with one another. Unions are seeking a 15% pay increase over the next three years for drivers and a 6% rise they say they were due to get under an agreement in 2009, but which was deferred. The strike comes about after unions rejected a Labour Court recommended 8.25% increase over the next three years. With reporting from Darragh Peter Murphy and Rónán Duffy. Email “Escalation: Dublin Bus drivers will strike for an additional 13 days”. Feedback on “Escalation: Dublin Bus drivers will strike for an additional 13 days”.